Olojeme is under investigation by the EFCC over alleged diversion of $48,485,127 from the accounts of the NSITF. The anti- graft agency has secured a court order to place the assets under interim forfeiture, pending Mrs. Olojeme’s trial. 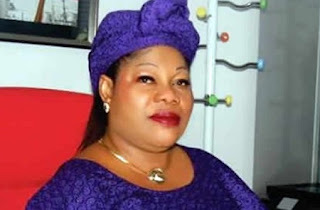 Besides, EFCC has obtained a warrant from the court to detain the suspect for two weeks to complete the first round of the investigation and her arraignment. Mrs. Olojeme, who is said to have taken ill, is at a private hospital in Abuja where EFCC detectives are keeping an eye on her. EFCC detectives uncovered 40 houses, 38 of which are believed to be Mrs Olojeme’s. Of the 38 houses, detectives rated the mansion at No. 51, Kainji Crescent in Maitama, as a “multi-billion naira piece with some foreign leaders occasionally staying there when they come visiting”. The golden mansion was at the weekend sealed off by the EFCC. A source, who spoke in confidence, said: “EFCC recovered over 40 properties out of which 38 belong to the ex-NSITF chairman, including the property at No. 51, Kainji Crescent, off Lake Chad Crescent in Maitama District. “The Kainji Crescent property is said to have housed some foreign leaders when they came visiting. It is a multi-billion naira mansion. “We have also secured a court order to detain her for two weeks in preparation for Dr. Ngozi Olojeme’s arraignment in connection with the alleged diversion of $48,485,127 from NSITF’s account. We have charges already prepared and we will be arraigning her soon. The EFCC has already arraigned a former Managing Director of NSITF, Umar Munir Abubakar, and four others for alleged diversion of N18billion. The others are Henry Ekhasomi Sambo, Adebayo Adebowale Aderibigbe, Chief Richard U. Uche and Aderemi Adegboyega. The cash was said to be the Federal Government’s contribution to the take-off grants and Employees Compensation Scheme (ECS) for Ministries Departments and Agencies (MDAs). EFCC’s report on preliminary investigation said in part: “That through this process, Dr. Ngozi Olojeme, the then NSITF board chairman, has collected a total sum of $48,485,127 from Mr. Chuka Eze (her account officer at FBN), which cash he collected on her behalf being the dollar equivalent of monies paid to BDCs by NSITF contractors. “She and others also diverted huge cash allocated for allowances of its staff and compensation to contributors. Detectives actually traced some of the NSITF funds in the personal accounts of Olojeme and the former MD, Umar Abubakar. “For instance, Abubakar and others dishonestly converted to N18billion, being contribution from the Federal Government of Nigeria as take-off grants and Employees Compensation Scheme (ECS) for MDAs. The report added: “It was discovered that the NSITF accounts in First Bank of Nigeria and other banks have witnessed a total turnover of over N62, 358,401,927 between 2012 and 2015 from the Employee Compensation Scheme contributions. “That out of the N62bn, the Federal Government contributed N13,600,000,000 while the sum of N48,758,401,927.80 was contributed by the private sector. That there were several payments to individuals and companies from the NSITF bank accounts for purported contracts or consultancy services.